Without a doubt Formula One Grand Prix Motor Racing is one of the most popular televised sports around the world. Unfortunately for viewers of terrestrial and cable television in Australia the sport often takes a second place to other programing. Network Ten in Australia provides comprehensive multi-day coverage of the Melbourne race activities, but not so for other races on the annual circuit. Diehard Formula One fans need not settle for delayed coverage of the race late at night, a number of digital satellite stations available in Australia and New Zealand offer live coverage of both days of qualifying action as well as the race itself. Star Television, a wholly-owned subsidiary of News Corporation operates the Star Sports channel from their studios in Hong Kong. Star Sports is easily received in Australia and New Zealand via the Asiasat 3 satellite. The channel has extensive Formula One coverage of both the qualifying events on Saturday and Sunday as well as the actual race. The Star Sports racing coverage is available free-to-air with a Chinese language commentary. If you would prefer to enjoy the race without commentary, the digital audio selections on the channel allow you to turn off the Chinese audio and just hear the actual sounds from the track. Star Sports also presents the same video coverage with an English language commentary, though this service is infrequently available free-to-air from Asiasat 3. However for viewers in Northern Australia, Star Sports English is often unencrypted on the Telkom 1 satellite. Global Television from Jakarta Indonesia also presents live coverage via the Palapa C2 satellite. This service also allows the viewer to select from multiple audio channels, which recently has also included English language commentary. Live French language race coverage is available in Australia and New Zealand via Intelsat 701. All television stations presenting F1 racing are required to use the same television video which is provided by the Formula One media body. However it is left to the individual stations to decide when to break to a commercial. Keen race fans will ensure they have at least two different services available during the race, allowing them to switch between the stations for uninterrupted coverage! 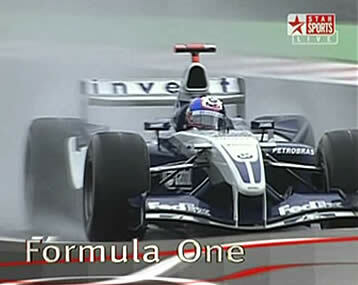 Star Sports is featured in the MediaExplorer package on DVD Disk Two. Global Television is featured in the MediaExplorer package on DVD Disk Four.